consisting of tightly bundled information circuits. 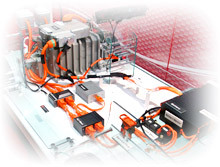 Wire harnesses are compactly bundled wires and data circuits that function as the central nervous system of a vehicle. To ensure safety and basic functions (going, turning and stopping), as well as provide comfort and convenience, automobiles are equipped with various electronics which operate using control signals running on electrical power supplied from the battery. The wire harness is the conduit for the transmission of these signals and electrical power. The Yazaki Group started producing wire harnesses in 1939, and today Yazaki Group wire harnesses are used by every carmaker in Japan, and can be found on many car models now on the road. With bases around the world, we also deliver wire harnesses and related parts to overseas carmakers. Yazaki has received high praise from major carmakers in each country, including Japan, and commands a top share of the world market. Moving forward, the Yazaki Group will evolve with the automobile while continuing to bring peace of mind to all. 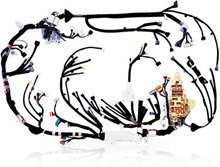 With the recent advances in automotive electronics, more complex wire harnesses are required. 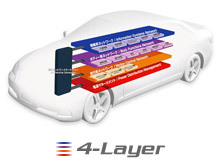 The transmission system of Yazaki-made wire harnesses is arranged into four network systems, all of which are connected to a "vehicle network gateway," which enables these networks to exchange information with each other. Yazaki Group has over ten years' experience producing high voltage power distribution systems. By drawing upon this valuable experience in the development of automotive components and systems as well as charging devices using external power sources, we are contributing to improvements in performance, reliability and convenience of hybrid and electric vehicles.